In Christopher Nolan's "The Dark Knight, the citizens of Gotham saw District Attorney Harvey Dent as their "White Knight," a public and incorruptible face of judicial justice cast against the sea of rampant mob corruption. When it came to crime, Harvey Dent was a blockade for Gotham, a gate through which the criminal underground had to find a way around. Dent recognized the impossibility of his stature, saying people like him either "die a hero or live long enough to see yourself become the villain." When it comes to the Pittsburgh Penguins...does that last bit sound familiar? 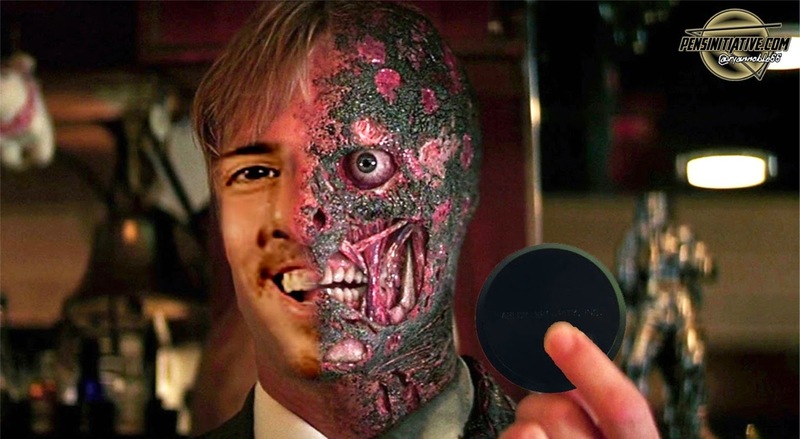 Ladies and gentlemen of the jury, I present to you Marc-Andre Fleury, the "Two Face" of the Gotham (Pittsburgh) Penguins. Fleury is the ultimate White Knight facsimile: when he's on, Fleury's athleticism elevates him to "Elite" backstopper status. When he is off, Fleury sows chaos and leaves a wake of broken-hearted (and furious) fans in his wake. Pittsburgh's fanbase loves a good villain: when the Steelers lose, blame inevitably falls on the quarterback. When the Penguins lose, the mantra changes to "blame the goalie," which for the past decade has been the mild-mannered netminder from Sorel-Tracy, Quebec. Fleury's most successful goaltending predecessor, Tom Barrasso, earned a not-so-endearing moniker of "Tom Barasshole" from the press and fans alike because of his surly demeanor. Barrasso also surrendered perhaps the most painful goal in franchise history, a Tom Fitzgerald 58-foot slapshot to the jugular of a populace expecting a third consecutive Stanley Cup. But while Fleury has never suffered such a singular moment of disappointment and has been a constant face of smiling, laughing and polite behavior for the entirety of his career, the fans only see the ugly, dark side of Fleury's playoff failings, and thus the image of "Fleury the Villain" dominates the mindset of hockey pundits. Does Fleury's happy-go-lucky actually aggravate the locals? Would Fleury's failings be better received if he answered the media with nothing but one word answers and glares? Would dropping the (genuine) nice guy act somehow endear himself to fans because he'd appear to "care" more? All of these emotions and reactions came to a head when GM Jim Rutherford honored his previous words and signed Fleury to a 4-year contract extension. Reaction to the deal was explosive, with polarized (and passionate) arguments coming down on both sides of the "Was the extension a good idea?" debate. As for my opinion on the contract extension, I believe that Fleury can win another Stanley Cup. I believe that his unteachable athleticism and ability to outright steal a game are more valuable commodities than a flawed save percentage stat. I believe that Fleury's unquestioned preparation and devotion to not only his craft, but to the Penguins and the city of Pittsburgh are an organizational asset. I believe that the Penguins will look back on this deal as an absolute steal. I believe in Marc-Andre Fleury.